When I started writing for the Honey Badgers about 2 years ago I had discussed depictions of men in anime, namely because of some of my own participation in anime geekdom. Now I think its time I do something I’ve done before with Samus Aran but this time with one of my favorite fictional characters ever – Captain Phantom F. Harlock! That would be a full study of his character. This is relatively more difficult with Harlock than it is with Samus due to the more ambiguous and mysterious nature of the good Captain as opposed to the Chozo bounty huntress, who is more straight-forward and linear of a character. This is because the way that Harlock is written. Each depiction is more based around rumors and legends rather than the recorded missions attributed to Aran. Such interpretations make each depiction of Harlock essentially a different person altogether based on a singular definitive archetype, that of the anachronistic and dark rouge, as opposed to the simple silent soldier. Funny enough, watching a longform video from friend of the Honey Badgers, the Wizard of Cause, Nick Goroff made me realize something about the world that this beloved character resides in. The idea of the story being a space opera isn’t exactly accurate, its actually more a space western! To be frank…. no, not Franklin…. I’m embarrassed to have not realized this before this point, considering the existence of the series Gun Frontier which is supposed to be a wild west era prequel to the entire series, meant to be a show of the eternal tie between the eternal friends Harlock and Tochiro. This is why the two characters fit so easily into such a setting, particularly in the story of the Meiji Restoration era samurai turned farmer Tochiro going off on his own tale of blood and vengeance backed by the friend he made at sea the pirate turned gunslinger Harlock. With that giving us the air of the world we are embarking upon Let’s Hammer This In! Now I stated that this world is space western, what do I mean by that? Harlock at his very core is an outlaw looking not for glory but freedom to live his life by his own will upon the vast frontier. If that’s not a Western archetype I don’t know what is! Considering the era Harlock creator Leiji Matsumoto-sensei is from and the ethos by which he himself lives, this is not only solid but obvious, having both his character and the characters of most Westerns pulling directly from the works of the master Akira Kurosawa, down to that penchant for imperfections shown by their respective creations. Honestly you can pull the intent of the journey from the name of the vessel Harlock captains alone: Arcadia – the ancient Greek paradise. I also mention the ethos upon which Harlock lives, Matsumoto-sensei in interviews has stated that he views Harlock as the incarnation of his best friend. At the same time both are seen wearing the ‘death’s head’ or his design of the Jolly Roger, which to him is not the traditional interpretation but an ideal that he will fight until he is down to his bones. Harlock’s is white for that reason. Matsumoto-sensei’s is red, showing that he will fight till his bones are bloodied. My own in my logo is black, denoting that I’ll fight till my bones are ash! Yes, I’ve been influenced that much by this image of masculinity, which is where we get to WHY I’m doing a character study of Harlock. His entire journey is that of the dichotomy of authority and rebellion in very masculine terms, even if depicted through the strong and noble women in his world. Harlock, in his mannerisms and stoic nature as he drinks “Red Bourbon,” a fictional high alcoholic variant of the drink of my Kentuckian roots, shows this innately. Garbed similarly to an eccentric biker, this futuristic pirate sports an eye-patch over what is explained as an injury from after his defection from the Earth’s Space Forces due to the innate corruption of the parliament, that being similar to the Japanese parliament of the 1970s, with which Matsumoto-sensei disagreed with vehemently. The scar that crosses his cheek is one from a prior battle of his youth. He has been seen wearing all leather with an epic pirate cape or occasionally wearing jeans along with similar garb made for him by his dead wife according to the Arcadia of My Youth continuity. I mentioned his ship before. With his character, you cannot begin to talk about a study of him without mentioning the ship he sails across the “Sea of Stars,” (Outer Space.) 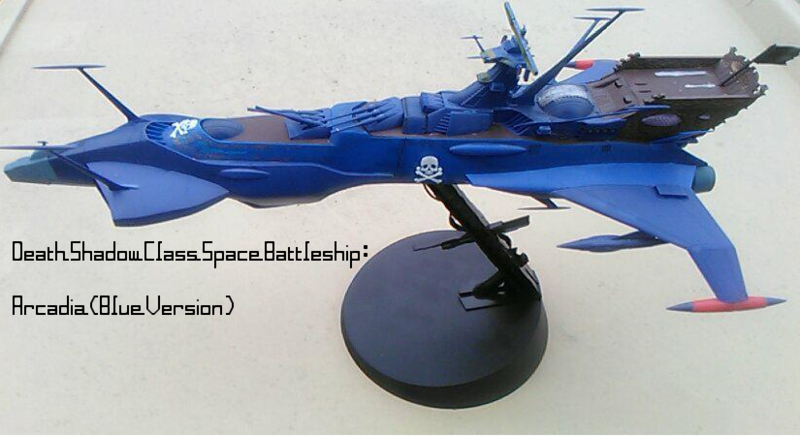 The first depiction of it is a blue ship, the flavor image of this very article being a model I myself built of the Deathshadow-Class Space Battleship. It being essentially a sister ship to his original ship known as the Death Shadow. Then eventually it evolves into the standard green ‘skull-nosed’ version that towers over several ships in sci-fi. Its often stated that it is 400 meters in length, putting it close to half a kilometer long and outclassing several ships from the Star Trek franchise and rivaling even the immense Star Destroyers of Star Wars’ Galactic Empire. Equipped with triple pulsar cannons, missile launchers, anchor tubes designed for boarding ships, and a “ramming mode,” the ship resembles an ungodly large jackknife. It also has a modified graviton engine that has been known to make energy weapons veer off course to avoid direct hits. It can be said that the two are one and the same. You can’t have one without the other. This could be attributed to the fact that both variations of the iconic pirate space-galleon were built by his eternal friend Tochiro. Often depicted as a short, awkward goof taking on many personality traits of the character’s creator Matsumoto-sensei, he is seen typically as ‘ugly,’ nearly blind without his glasses, slightly cowardly, but stalwart when he sees someone in pain. In many ways its impossible to do a full study of Harlock without studying Tochiro as well because as stated earlier, they are shown to be friends in many eras, even becoming fast friends in Nazi Germany when Harlock as a Nazi pilot crash lands at the border to Switzerland to help his friend get out safely, then turns around and heads back to be captured by the French Resistance, taking responsibility for the crimes of his country. He was only fighting for the Third Reich as his way of ‘paying rent,’ stating that his family grew as a sort of pirate knight clan in Germany. It’s an obvious anti-war and anti-Nazi message while showing that most men tend to only fight for the wrong thing when duty comes to mind. This also shows not only the dignified honor of men but their innate disposability to society as well. In fact, one of the most heart-wrenching and hard hitting scenes showing the true strength of masculinity of Harlock and Tochiro comes from Arcadia of My Youth, perhaps my favorite movie of all time. Its about an hour into the two and a half hour epic, Harlock had just lost his eye and finished listening to a message from his wife. They are ready to flee the planet with Tochiro to be free to fight for Earth another day, then confront a group of humanoid aliens called the Tokargans who work for the enemy Illumidas which have occupied the Earth. Harlock initially thinks they’ve become nothing more than attack dogs of the imperial fascists when La Mimeh, a variation of the series staple character narrates their plight, stating that the Tokargans, led by Zoll, are simply trying to find a way to go back and fight for their home, which they learned was about to be liquidated by the Illumidas fleet as it had served its purposes. Their intent was to take their friends’ ship, the Queen Emeraldas. Tochiro objects, stating that Emeraldas would lose her free-trade license if her ship were used, he and didn’t wish for her to lose her profession. Zoll then breaks down to his knees begging for the ship, wishing nothing more than to try and save at least his little brother and sister, for whom he cared so much. Harlock apologizes for the ‘heartless’ things he said when he mistook their intent and consoles the seemingly helpless military leader. The story hits the compassionate Tochiro so hard, as he sees the agony in Zoll’s eyes and heart, that he breaks down crying and almost hugs the man, as he thanks him for being the only soul that cried at his story. With what has happened to my own brother to this very day I can’t get through this scene without crying and I can say that without shame. This scene alone is a testament to the true hearts of men and boys, their overflowing compassion and empathy for their peers, the difficulty it takes at times to control one’s passions and sorrows and the strength inherent in keeping such hearts in check without cutting them off nor giving into them wholly. If you can only watch one thing based on the Captain I implore that it be the whole of this movie, uncensored in its original Japanese and in full screen, not solely through the linked YouTube video but on disc or on stream. I guarantee you that I’m not being paid to say that nor suggest this lightly. You will not regret the it! Moving on to Harlock’s morality, he is an outlaw at his core. He has little to no respect for authority or authoritarians, so much so that even though he is the captain of his ship he has only one rule: live by your own will! He says clearly in multiple series that there are times where he will give orders but whether his crew follows them or not is up to them. He will not reprimand them if they say no and will not discipline them if they become rowdy as long as they stay true to themselves and their friends. You’d think this would make a chaotic mess for a battleship but it’s through this dedication to essentially an anarcho-libertarian outlook that his crew is loyal to him. When push comes to shove, they’ll dig in and pull through because they can see each other not as underlings and a captain but as solid friends loyal to an ideal of true freedom for freedom’s sake, a very brigadier frontier mentality that some could say defines Americana at its core. In many ways Harlock is a futuristic Robin Hood. He steals from the corrupt and paid off political class of his universe, keeps just enough food for himself, while providing the rest to hard working families that aren’t able to afford it for themselves under the truly oppressive system depicted, while disposing of the symbols of excess that can be attributed often to more communistic states. A being like Harlock would likely be highly regarded in Nicholas Maduro’s Venezuela about now. Now I said that there is a positive authoritative side shown in Harlock’s world. This usually is depicted like Illumidas’ General Zeda in Arcadia of My Youth or Commander Kiruta in the original series, who is replaced by the similarly named Irita in the series Endless Odyssey, who has a similar code and tactics. Now these three have all done some relatively dark and devilish things in their respective depictions, but this was done in ways not only to try to demonize the pirate but as a last resort. These were acts they didn’t like doing themselves, though their superiors and underlings held no qualms performing such atrocities. In the end, these antagonists eventually see Harlock as a friend, in a weird way, showing how honest men can respect and see merit in one another even on opposing sides. Last but not least, there is the way Harlock fights his battles. He takes the approach that he won’t send anyone to do something he won’t do himself. As such, he usually is the first one to board a ship or pull out his Gravity Saber (a sword/rifle hybrid) or his Cosmo Dragoon (a laser blaster modeled after the Walker Colt Dragoon from the wild west that has influenced the Leijiverse). He can be seen as cyclopean demon in battle, barreling through any pain he endures and showing no mercy to those who stand against them, especially when facing him of their own free will. He goes through his life under a single phrase: “This flag stands for Freedom, and I live for what it stands for!” The flag he mentions is, of course, the pirate’s flag he flies, intent on living a life free of regrets, and only apologizing for true mistakes. I love the character of Harlock and in some ways have modeled my own code of ethics after his. Even if he isn’t always right he always does what he feels is the right act for the moment. If he feels people need a villain he will take up that mantle and all the agony that comes with it, even if it means he can’t step foot on his homeland ever again. His eternal battle is that of freedom for all, wanting a better life for everyone even if it means he must suffer their ire and disdain. He is a tragic soul to be sure, but one worth respect and admiration. In becoming the outlaw he fulfills the hero’s journey in the end. To not view this character at all would be to do yourself a massive disservice, especially if you choose that because of the medium in which it is shown. Harlock as a character is a masterpiece unto himself, even if not everything he has been in is considered as such. With this, I implore you to watch something with Harlock in it, and Please Remember to Game Freely!